An artist, musician, or writer can’t just take another person’s creation and claim it as their own. Federal law outlines how creators can and can’t borrow from each other. These rules are collectively called “copyright law,” and essentially they give creators the exclusive right to copy, modify, distribute, perform, and display their creative works. For Fair Use Week this year, Radio Berkman’s Daniel Dennis Jones talked to Leo Angelakos and Olga Slobodyanyuk from the Cyberlaw Clinic at the Berkman Center for Internet and Society about what constitutes fair use. Daniel Dennis Jones: It’s time to learn everything you need to know about the history of Fair Use, in six minutes or less. I’m Daniel Dennis Jones, and this is Radio Berkman. Let’s start the clock! This is “Pretty Woman,” co-written by singer Roy Orbison and released in 1964. The copyright belongs to Orbison’s publisher, Acuff-Rose Music. Fast forward 25 years. It’s 1989 and the rap group 2 Live Crew releases “Pretty Woman” on their album, “As Clean as They Wanna Be.”Shortly thereafter, Acuff-Rose sues 2 Live Crew’s label for copyright infringement. Basically, Acuff-Rose says, hey, this song isn’t yours. According to the Copyright Act of 1976, this song is ours. You want to play it? You have to pay us. Leo Angelakos: Copyright law gives creators — such as authors and artists — the exclusive right to copy, modify, distribute, perform, and display their creative works. DDJ: Copyright law was originally created as an incentive for artists and creators. If creators aren’t worrying about whether someone might steal their work, they’re more likely to share their ideas with the public. This kind of sharing in turn helps to create more ideas, as well as products and jobs and art and whole industries, all that good stuff. In the Pretty Woman case the publisher, Acuff-Rose, owned the copyright and therefore had the sole right to copy, modify, and distribute that song. But this is where things get really interesting. This case made it all the way to the Supreme Court. In the end 2 Live Crew won. They were allowed to do their own spin on the song, without paying and without permission from Acuff-Rose, and here’s why. 2 Live Crew’s defense was that their version of Pretty Woman was a parody of the original. For that reason they argued it fell into this safe zone under copyright law called fair use. Olga Slobodyanyuk: Fair use is a defense to copyright infringement. Fair use let’s you use someone’s copyrighted work without permission as long as you do it in a way that adds new meaning to the work. LA: The Supreme Court found 2 Live Crew’s version to be a parody and it was thus a fair use because it ridiculed the innocent nature and outdated troupes of the original song. DDJ: And they say that what makes this court opinion so interesting is there is actually no explicit mention of parody in copyright law. Taking inspiration from a precedent set by a 19th century court case, Congress decided to build Fair Use into copyright law in 1976, realizing that it helped fulfill the law’s original purpose of incentivizing creators. LA: And fair use is actually a really flexible doctrine. It can cover a wide-range of works. Olga: It’s central to fulfilling the constitutional purpose and it balances the public’s first amendment rights against monopolies granted by copyright. DDJ: A monopoly in this sense is the fact that one person – or one band, or one copyright owner – has complete and total control over a piece of content, and everything that gets done with it – recording, performing, translating, remixing, adapting, modifying, you name it. There are a number of examples where the use of a copyrighted work is important to furthering some other goal. It could be an artistic use. It could be in journalism, or for some kind of educational use. When judges and lawyers are considering whether something is fair use, they look at 4 factors. LA: First the purpose and character of the use. OS: Courts have construed this to mean that a fair use is one that transforms the copyrighted work to add new expression, meaning or message. For example, a student can quote a stanza of a poem in an essay where it’s critiquing the poem because that critique of the poem will make the use transformative. DDJ: Transformative. That’s the key word. Are you using a portion of the copyrighted work in a context that makes a new statement? If so, that might be Fair Use. A good example of the transformative factor occurred in a court case where documentary filmmakers used a John Lennon song paired with images of the Cold War to suggest that Lennon’s message was naive. OS: The court found that this use was transformative because the filmmakers criticized Lennon’s lyrics in a way that added new meaning to them. LA: The second factor asks how expressive the genre of the work is and whether it’s published or not. DDJ: If a creator hasn’t published the work yet, it is more strongly protected by copyright, because they should have control over when it first goes public. OS: The third factor asks how much of the original work was taken. This inquiry includes both a qualitative and a quantitative component. For example, the less words you take, the more likely it is to be a fair use. DDJ: So if you’re literally copying someone’s entire book and republishing it, you’re probably not going to get away with calling it fair use. But if you’re quoting a small passage, you probably will. LA: And the fourth factor asks whether the use would replace the demand for the original work in the marketplace. So for example, if someone publishes a glossary that defines terms from the Harry Potter series, such a glossary could usurp the demand for a similar glossary by J.K. Rowling and courts might not find that to be a fair use. DDJ: In other words, if people are consuming the thing you created as a substitute for something created by the original creator, you’re walking on thin ice. This fourth factor of fair use also plays a role in that Supreme Court case we mentioned earlier. Two years before the case went to the Supreme Court, a federal appeals court ruled that 2 Live Crew had a “blatantly commercial purpose” in recording its version. In other words the demand for the the parody replaced that of the original work, and that should deprive the 2 Live Crew song of all protection under the copyright law. But the Supreme Court said no to the lower court’s decision, which validated parodies under fair use, even when someone makes money off of them, as a creative work deserving of consideration. And that’s everything you need to know about Fair Use in 6 minutes or less! 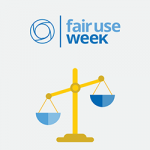 Celebrate Fair Use by going to fairuseweek.org where you can find infographics, videos, and all kinds of resources about fair use. This week’s episode was written by Leo Angelakos, Elizabeth Gillis, Daniel Dennis Jones, and Olga Slobodyanyuk, and edited by Elizabeth Gillis. Special thanks this week to Andres Lombana-Bermudez of the Youth & Media Team, and Chris Bavitz of the Cyberlaw Clinic. You are wright An artist, musician, or writer can’t just take another person’s creation and claim it as their own.